You might wonder if one hour once a week really matters. According to Jocelyn it does. 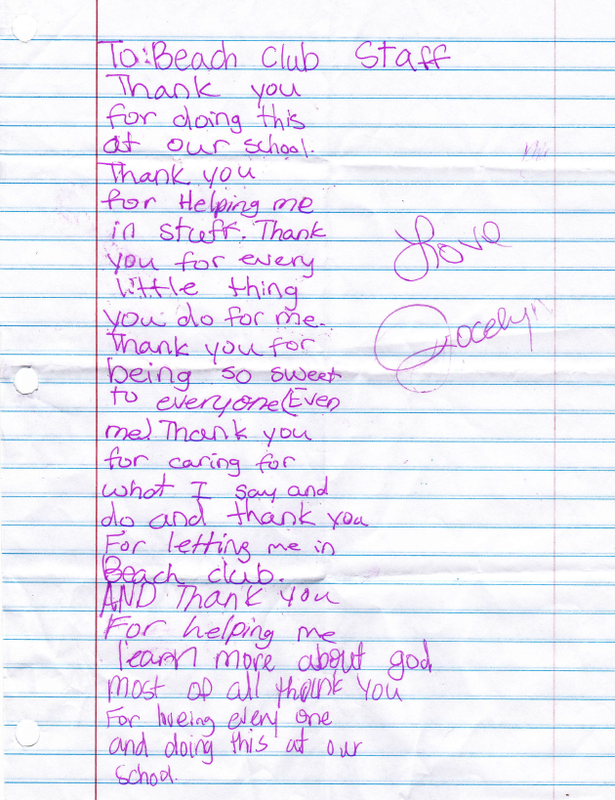 Last week one of our Mississippi Area Directors received this sweet letter of thanks from a young clubber named Jocelyn. Thank you for doing this at our school. Thank you for helping me in stuff. Thank you for every little thing you do for me. Thank you for being so sweet to everyone (even me). Thank you for caring for what I say and do and thank you for letting me in Beach Club. And thank you for helping me learn more about God. Most of all thank you for loving everyone and doing this at our school." It’s true, meeting kids where they are really does make a difference. We love being used by God to make Jesus Cool at School and impact so many lives just like Jocelyn. Visit our partners page for all active Beach Clubs or contact us about starting a Beach Club in your area.